Just Jeeps MOPAR All-Weather Front & Rear Floor Liner Set For 2018+ Jeep Wrangler JL Unlimited 4 Door Models | Jeep Parts Store in Toronto, Canada. Protect the floor of your new JL with the Mopar All Weather floor liner pair. 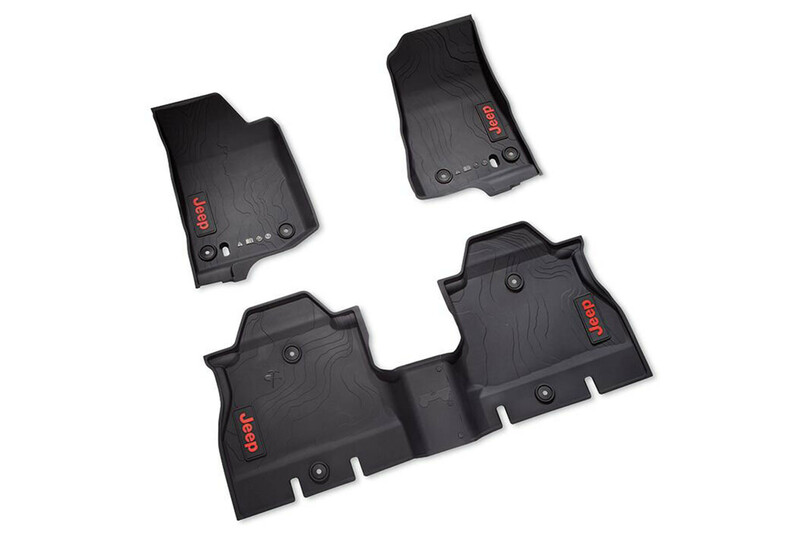 This 3-piece set will fit into the driver and passenger side front foot wells, and the rear seat foot wells, and will protect the floor from any wetness front snow, mud, sand, rain or anything else that could possibly be trekked in from the outside elements. The floor liners are a high wall, bucket-style construction that provides maximum coverage and protection. The front set features a terrain style pattern with the red Jeep brand logo. They fit perfectly over the front drain holes to allow for draining without having to remove the mat. The mats will stay in place with the durable nibbed backing and grommets that attach to the factory retention posts.